Blatant scientific fraud and global warming alarmism have been best buddies for quite some time. But hundreds of emails pilfered from a major British university climate change center are stunning even to those who know what a whopping load of crap global warming is. The emails are available in an easy-to-digest format HERE. There are somewhere in the vicinity of a thousand-plus, along with some 72 documents. I’ve just completed Mike’s Nature trick of adding in the real temps to each series for the last 20 years (ie from 1981 onwards) amd from 1961 for Keith’s to hide the decline. the crap out of him. Very tempted. ……Phil and I have recently submitted a paper using about a dozen NH records that fit this category, and many of which are available nearly 2K back–I think that trying to adopt a timeframe of 2K, rather than the usual 1K, addresses a good earlier point that Peck made w/ regard to the memo, that it would be nice to try to “contain” the putative “MWP”, even if we don’t yet have a hemispheric mean reconstruction available that far back…. And, perhaps most reprehensibly, a long series of communications discussing how best to squeeze dissenting scientists out of the peer review process. How, in other words, to create a scientific climate in which anyone who disagrees with AGW can be written off as a crank, whose views do not have a scrap of authority. Hadley CRU has form in this regard. In September – I wrote the story up here as “How the global warming industry is based on a massive lie” – Hadley CRU’s researchers were exposed as having “cherry-picked” data in order to support their untrue claim that global temperatures had risen higher at the end of the 20th century than at any time in the last millenium. Hadley CRU was also the organisation which – in contravention of all acceptable behaviour in the international scientific community – spent years withholding data from researchers it deemed unhelpful to its cause. This matters because Hadley CRU, established in 1990 by the Met Office, is a government-funded body which is supposed to be a model of rectitude. Its HadCrut record is one of the four official sources of global temperature data used by the IPCC. I asked in my title whether this will be the final nail in the coffin of Anthropenic Global Warming. This was wishful thinking, of course. In the run up to Copenhagen, we will see more and more hysterical (and grotesquely exaggerated) stories such as this in the Mainstream Media. And we will see ever-more-virulent campaigns conducted by eco-fascist activists, such as this risible new advertising campaign by Plane Stupid showing CGI polar bears falling from the sky and exploding because kind of, like, man, that’s sort of what happens whenever you take another trip on an aeroplane. The world is currently cooling; electorates are increasingly reluctant to support eco-policies leading to more oppressive regulation, higher taxes and higher utility bills; the tide is turning against Al Gore’s Anthropogenic Global Warming theory. The so-called “sceptical” view is now also the majority view. Unfortunately, we’ve a long, long way to go before the public mood (and scientific truth) is reflected by our policy makers. There are too many vested interests in AGW, with far too much to lose either in terms of reputation or money, for this to end without a bitter fight. But if the Hadley CRU scandal is true,it’s a blow to the AGW lobby’s credibility which is never likely to recover. You can’t even begin to imagine what a pure scientific fraud all this global warming crap is. O’BRIEN: ...to create energy, and it sounds to me like an evil plan by Lex Luthor to defeat Superman. Can you, can you tell me, is this a viable solution, geothermal energy? The problem is that even the earth’s core is only around 2,000-7,000 degrees Celsius (we can’t get to it to measure it precisely). The whole “several million degree” thing is the blathering idiocy of a blathering idiot. A blathering idiot who received a Nobel Prize for Science. This is on top of the fact that Al Gore’s new book pimping global warming relied on photoshopping to artificially “show” the effects of global warming. And THAT’S on top of the fact that the propaganda film that Al Gore won his Nobel Prize for science in the first place was based on documented exaggerations and lies. An Inconvenient Truth won plaudits from the environmental lobby and an Oscar from the film industry but was found wanting when it was scrutinised in the High Court in London. Mr Justice Burton identified nine significant errors within the former presidential candidate’s documentary as he assessed whether it should be shown to school children. He agreed that Mr Gore’s film was “broadly accurate” in its presentation of the causes and likely effects of climate change but said that some of the claims were wrong and had arisen in “the context of alarmism and exaggeration”. In what is a rare judicial ruling on what children can see in the class-room, Mr Justice Barton was at pains to point out that the “apocalyptic vision” presented in the film was politically partisan and not an impartial analysis of the science of climate change. There were at least nine significant bogus claims contradicted by science in Gore’s Inconvenient Truth. But that didn’t stop him from receiving a Nobel Prize for it. 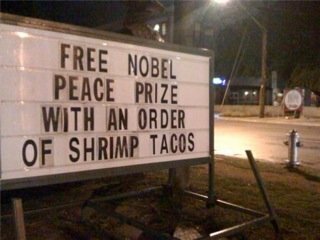 The Nobel Prize for Leftwing Propaganda. When you include the Nobel Prize for Accomplishing Nothing that Barack Obama “won,” you begin to see what an empty suit our chief institutions of leftwing credibility truly are. But it’s worse than making the Nobel committee or the Nobel Peace Prize a mockery. What has happened with global warming has made science itself a mockery. There are a few truly good scientists out there. But there are way too many partisan ideologues who are willing to go to any lengths to pass of ideology as science. And the new “Galileos” are those who stand in the way of liberal secular humanists academics for whom ideological political power and science are one. The “scientists” who support global warming theory are not scientists, regardless of their degrees or positions. They are propagandists. They are political ideologues who seek to exploit their positions to impose economic redistributionism on people who can scarcely afford to make ends meet as it is. It doesn’t seem to matter how many times these pseudo-scientific fascist frauds are caught lying, fabricating data, making bogus claims, or generally defecating on the principles, methodologies, and ethics of science. They just keep rolling merrily along as an equally dishonest, ideological, and propagandistic media covers up for them. And if I may make one more comment: the people who are trying to impose ObamaCare on us are the same sort of people who are using the same sort of deceit. [In reference to a] New York Times article [which] opined, “The evidence pointing to a growing human contribution to global warming is so widely accepted that the hacked material is unlikely to erode the overall argument.”Climatologist Patrick J. Michaels challenged that position. “This is not a smoking gun, this is a mushroom cloud.” The e-mails implicate scores of researchers, most of whom are associated with the UN’s Intergovernmental Panel on Climate Change (IPCC), an organization many skeptics believe was created exclusively to provide evidence of anthropogenic global warming (AGW). When someone said that no occupant of the White House had ever been able to walk on water, liberals rushed in to correct us: no previous occupant of the White House has been able to walk on water. Barack Obama was going to be different. He was going to be the Messiah who replaced God with Government, and would be anointed as the Savior of the world. I mean, wow. It’s not like he didn’t promise the world, well, the world or anything. But something happened to Captain Amazing after he actually took office: a fundamental inability to even begin to walk his talk. We all remember Obama receiving the Nobel Peace Prize for his two signature accomplishments of Jack and Squat. And that Nobel Prize for Accomplishing Nothing may be the symbol of the Obama administration. We tend to forget about how he promised his stimulus would prevent unemployment from reaching 8% (it’s now 10.2% and rising), or how pathologically pathetic his administration has since been in fabricating statistics to show his $3.27 trillion porkulus has been anything other than an abject failure. Here’s a stimulus success story: In Arizona’s 15th congressional district, 30 jobs have been saved or created with just $761,420 in federal stimulus spending. At least that’s what the Web site set up by the Obama administration to track the $787 billion stimulus says. There’s one problem, though: There is no 15th congressional district in Arizona; the state has only eight districts. And ABC News has found many more entries for projects like this in places that are incorrectly identified. Oh, there’s more “there” there. A lot more. More dishonest butchery of employment statistics than you could ever hope to shake a stick at. With unemployment among blacks at more than 15 percent, the N.A.A.C.P. will join several other groups on Tuesday to call on President Obama to do more to create jobs. The organizations — including the A.F.L.-C.I.O. and the National Council of La Raza, a Hispanic advocacy group— will make clear that they believe the president’s $787 billion stimulus program has not gone far enough to fight unemployment. But since then, his self-justifying fabrications have been increasingly absurd and asinine. To those brainwashed liberals who insist that the economy would have been worse if Obama hadn’t passed the stimulus, let me put it this way: the economy would have been worse if George W. Bush hadn’t done everything he did, too. I mean, one load of baloney deserves another. Obama has watched the American death toll in Afghanistan double from George Bush’s last year in office. And his dithering over making the obvious decision to send the troops his own general requested has turned any momentum we may have been able to create into abject failure. Both friend and foe alike should question Obama’s commitment, along with his competence. Then we’ve had the mindboggling exhibition of incompetence in the Obama administration’s bungling of the H1N1 vaccine. Lower the level of the oceans? Obama can’t even raise the level of the flu doses! Barack Obama cast himself as a “citizen of the world” when he delivered his well-received campaign speech in Berlin in the summer of 2008. But the US president has now betrayed this claim. In his Berlin speech, he was dishonest with Europe. Since then, Obama has neglected the single most important issue for an American president who likes to imagine himself as a world citizen, namely, his country’s addiction to fossil fuels and the risks of unchecked climate change. Health-care reform and other domestic issues were more important to him than global environmental threats. He was either unwilling or unable to convince skeptics in his own ranks and potential defectors from the ranks of the Republicans to support him, for example, by promising alternative investments as a compensation for states with large coal reserves. The Democrat-controlled Senate put off Obama’s cap-growth-and-tax-prosperity climate agenda until Spring (and good luck passing that economy killing monstrosity then! ); and world leaders just said, “Better luck next time” with their climate change treaty. – failed. I mean, who wouldn’t want shockingly high energy prices? Who doesn’t want to freeze in the dark? Sorry, Barry Hussein. If you want to live up to your promise to lower the oceans and heal the planet, I guess you’ll just have to start doing a lot more shutting the hell up and saving the planet from all your useless hot air. Because other than that, you did squat. Obama was awarded the Nobel Prize only twelve days after his inauguration. By then, some anonymous figure decided Obama had already saved the world, and by then, the liberal/socialist fix was in. Obama now shares the honor of receiving a Nobel Prize with his fellow agent of man-caused disaster (that the left likes to call “change”), Yassar Arafat. And of course, he also shares the great honor of the Nobel with the previous worst American president ever, Jimmy Carter. January 20: Sworn in as president. Went to a parade. Partied. January 21: Asked bureaucrats to re-write guidelines for information requests. Held an “open house” party at the White House. January 23: Ordered the release of federal funding to pay for abortions in foreign countries. Lunch with Joe Biden; met with Tim Geithner. January 24: Budget meeting with economic team. January 26: Gave speech about jobs and energy. Met with Hillary Clinton. Attended Geithner’s swearing in ceremony. January 27: Met with Republicans. Spoke at a clock tower in Ohio. January 28: Economic meetings in the morning, met with Defense secretary in the afternoon. January 29: Signed Ledbetter Bill overturning Supreme Court decision on lawsuits over wages. Party in the State Room. Met with Biden. January 30: Met economic advisers. Gave speech on Middle Class Working Families Task Force. Met with senior enlisted military officials. January 31: Took the day off. February 1: Skipped church. Threw a Super Bowl party. The thing that makes me laugh is the contrast from just a week ago, as Saturday Night Live demonstrated what an empty suit Obama has truly been. FRED ARMISEN AS BARACK OBAMA: There are those on the right who are angry. They think that I’m turning this great country into something that resembles the Soviet Union or Nazi Germany, but that’s just not the case. But when you look at my record it’s very clear what I’ve done so far and that is nothing. Nada. Almost one year and nothing to show for it. And remember, I can do whatever I want. I have a majority in both houses of Congress. I could make it mandatory for all gays to marry, and require all cars to run on marijuana. But do I? No! But it’s not all bad news. I have a few accomplishments. The Cash for Clunkers program really stimulated the economy. Unfortunately it was the economy of Japan! Let’s see, what else? Also, I killed a fly on TV, remember that? Uh, I brought a white police officer and a black professor together for a beer. Who else could do that? You’re right — Oprah. But no one else. As the New York Post puts it, “The Nobel committee assembled in Oslo said the prize was given to Obama more for his promise than for his performance, saying his main accomplishment was ushering in ‘a new climate in international politics.’” And I think that’s true. Under Obama’s presidency, Iran will have nuclear weapons. And we will truly see “a new climate in international politics” as Iran exports terrorism with the impunity that only having nuclear weapons can provide. I think this ultimately shows how futile the left is – whether in Norway or America. It shows just how intellectually and morally bankrupt liberalism truly is. The fact that Obama has accomplished nothing is immaterial; all that matters is he is the personification of “hope and change” and talking unicorns. The left doesn’t stand for anything other than the left. George Bush – or anyone who holds conservative principles, for that matter – could literally duplicate the Twelve Labors of Hercules. And still collect – in the words of the SNL skit – “Jack and Squat” from the mainstream media, the United Nations, the “international community,” and certainly the Nobel Prize committtee. The award of the Nobel Prize to Barack Obama – other than making utterly meaningless the Nobel Prize (which, let’s face it, long-ago made itself meaningless) – is a demonstration that there is dedicated wholly to giving to socialists, and taking way from anybody else. The left loves to represent itself as “standing for the little guy.” But that is not even close to being true. Rather, they stand as part of a gargantuan, power-hungry, global and globalist movement that already controls most of the pieces of the world chessboard, and demands to control all of them. We can go back and look at Al Gore, a documented fraud, a presenter of entirely false scientific claims, and the winner of a Nobel Prize for science. A British High Court judge found nine “glaring” scientific errors in the Inconvenient Truth “documentary” that garnered Gore his scientific credibility. But the only “inconvenient truth” was that the film was an example of “alarmism” and “exaggeration” and was not fit for viewing by British school children. “Science” has officially and for the record made itself a propaganda tool to advance radical redistributionist social policies. And now we have another Nobel prize winner doing the same thing to his own field of economics. CLARKE: I wanted to go back to the international climate-change negotiation process. So assuming we had a perfect U.S. bill — written by you or by 15 experts working on this full time — how would the international negotiation process work? It’s not obvious that averting global climate change is in the rational self-interest of anyone that is alive today. The serious consequences probably won’t occur until 2080 or 2100 or thereafter. That’s one problem. Another problem is that those consequences are going to be distributed in a radically uneven way. The northwest of the United States might actually benefit. So how does a negotiation process work? How does a generation today negotiate on behalf of future generations? And how do we negotiate when the costs are distributed so unevenly? SCHELLING: Well I do think that one of the difficulties is that most of the beneficiaries aren’t yet born. More than that: Most of the beneficiaries will be born in what we now call the developing world. By 2080 or 2100 five-sixths of the population, at least, will be in places like China, India, Indonesia, Africa and so forth. And what I don’t know is whether Americans are really willing to understand that and do anything for the benefit of the unborn Chinese. SCHELLING: It’s a tough sell. And probably you have to find ways to exaggerate the threat. And you can in fact find ways to make the threat serious. I think there’s a significant likelihood of a kind of a runaway release of carbon and methane from permafrost, and from huge offshore deposits of methane all around the world. If you begin to get methane leaking on a large scale — even though methane doesn’t stay in the atmosphere very long — it might warm things up fast enough that it will induce further methane release, which will warm things up more, which will release more. And that will create a huge multiplier effect, and it could become very serious. CLARKE: And you mean serious for everyone, including the United States? SCHELLING: Yes, for almost anybody. CLARKE: And when you say, “exaggerate the costs” do you mean, American politicians should exaggerate the costs to the American public, to get American support for a bill that will overwhelmingly benefit the developing world? SCHELLING: [Laughs] It’s very hard to get honest people. SCHELLING: Well, part of me sympathizes with the case for disingenuousness! I mean, it seems to me that there is a strong moral case for helping unborn Bangladeshi citizens. But I don’t know how you sell that. It’s not in anyone’s rational interest, at least in the US, to legislate on that basis. Well, let me at least agree with Thomas Schelling to this extent: yes, it is indeed hard to find honest people. Especially from our “experts” whom we count upon to inform us of the facts, rather than leading us by the hand to conclusions based on false premises becauses they are arrogant elitists who think only they are smart enough to handle the truth. The article goes on – read it here – with a seriously leftist-tilted back-and-forth about climate change and the degree to which America is morally obligated to commit economic hari kari in order to atone for its sins to the developing world. CLARKE: I wanted to ask one more question, to go back to the moral issue here. It does seem to me that the strongest case for mitigating the effects of global climate change is a moral one. It is based not on our own interest but on the interests of people in the developing world who don’t yet exist. But it also seems to me that — while I don’t know much about game theory — collective bargaining theories generally assume the participants are rational and self-interested. So how does one go about making sense of an arrangement where we must set our self-interest aside? How does one make the moral case in a situation like this? Or is my description of collective bargaining just totally idiotic? SCHELLING: And I think the churches don’t realize that they could have a potent effect in not letting so much of god’s legacy — in terms of flora and fauna — be destroyed by climate change. SCHELLING: But I tend to be rather pessimistic. I sometimes wish that we could have, over the next five or ten years, a lot of horrid things happening — you know, like tornadoes in the Midwest and so forth — that would get people very concerned about climate change. But I don’t think that’s going to happen. Now, Thomas Schelling one the one hand tells us that we should feel intensely morally obligated to “beneficiaries [who] not yet born” – as long as they’re not “a two month old fetus” who is presumably about to be aborted – in which case we apparently have absolutely no obligation at all. But stop and think: the moral logic of abortion means the future generation doesn’t matter unless we subjectively want them to matter. No one who advocates abortion has any right to lecture others that they should not only care about but sacrifice for “beneficiaries not yet born.” Then Schelling proceeds to presume from his own massive personal arrogance that the American people’s moral intuitions are faulty, but that his are functioning perfectly. Which of course justifies him in lying to us to steer us toward the conclusion dictated by his own superior moral reasoning. And then this man who presumes himself to be so morally superior to everyone “beneath” him, who is entitled to “exaggerate the threat” of global warming because Americans are not responsible to make sound moral decisions if they know the truth, says he hopes “horrid things” happen to we the poor, the huddling, the ignorant and unwashed masses. This economist seems to live more by the law involving the telling of a lie often enough that it is believed far more than by the law of supply and demand. And we have the same types of people as Thomas Schelling suppresing the conclusions of science that show the opposite of what they want science to show. Consider the White House’s suppression of a scientific report by the EPA. Or you can go back to the “hockey stick model” to see just how far “respected” scientists are willing to go in order to pass off a bogus theory for mass consumption — and just how willing other scientists are to unquestioningly accept whatever “evidence” supports their preconceived ideological notions. Aside from the fact that building scientific evidence indicates that global warming is a gigantic load of malarkey (just consider how the fact that the planet ISN’T warming has now led the alarmist movement to instead begin using the term “climate change”), global warming-turned climate change alarmists have an even bigger problem to worry about: the fact that the developing world has no interests in committing their own versions of hari kari for the sake of a theory. China and India are poised to become “global warming polluters” on such a scale that any reductions in American and European greenhouse gasses would be utterly insignificant. So why should we dramatically undermine our lives? Chinese and Indians know what it’s like to live in a mud hut, which is the inevitable result of dramatically hamstringing our economic output to conform to the demands of the global warming alarmists. The western radicals either don’t know what such deplorable conditions are like, or they believe that they – being the true arrogant elitists they are – will continue to live in their glass houses or ivory towers. Call me a Global Stupidity theorist. I have come to believe that one of the greatest crises that mankind faces today is due to anthropogenic global stupidity. Runaway global warming alarmism has pushed pseudo-science superheated emissions to dangerous levels much faster than previously estimated and, instead of reaching the threshold within a decade, it was actually crossed two years ago. Anthropogenic global stupidity may have pushed earth past the tipping point, according to one study. I’m ridiculing these idiots, obviously. But you have to laugh at such paranoid nonsense. VICE PRES. GORE: Well, I, I mean, I think there’s a consensus now that it’s happening even more rapidly than the scientists were telling us years ago. We’re seeing record high temperatures. Nine of the 10 hottest years ever recorded have, have been in the last couple of decades. We’re seeing the stronger storms. We’re seeing the damage that, that people–and our national security experts–the military intelligence, the Pentagon, the National Intelligence Defense Council–they have warned us about the national security threats from potentially hundreds of millions of climate refugees caused by the climate crisis. This is really–just this, this past week, the EPA said the American way of life is threatened. MR. BROKAW: Chuck Todd, David Gregory, welcome to both of you. Let’s begin with Al Gore. Well, under the theory that “No one is better informed on this issue of energy conservation and global climate change than Al Gore is,” you’d at least expect him to get his pertinent facts somewhat correct. But nope. Al spouts off debunked idiocy the way Jesus spouted off universal wisdom. His claim that “We’re seeing record high temperatures. Nine of the 10 hottest years ever recorded have, have been in the last couple of decades”? Just plain NOT. NASA was forced to revise its rankings for the hottest years on record after a blogger – A BLOGGER – discovered serious mathematical errors in the process that the agency so advanced it sends rockets to Mars had relied upon to advance the global warming myth. The new figures are available at this official NASA/GISS site. The higher the positive annual mean figure, the warmer the year was. Five of the top ten occur prior to 1940, before mainstream scientists believe humans had any discernible impact on temperatures, and six of the top ten hottest years occurred before 90 percent of the growth in greenhouse gas emissions during the last century occurred. I’ve got a better “Nine out of 10” sort of figure for you. Reason Magazine ripped Al Gore’s credibility to shreds. That didn’t stop Gore from garnering a Nobel Prize. Apparently, Joseph Goebbels-like propaganda tactics are now perfectly acceptable in today’s postmodern version of “science.” If your ideology is suitably politically correct, it no longer matters if all your “facts” are actually wrong. It is downright scary. And he’s making scientifically indefensible and, yes, alarmist and exaggerated claims regarding storms as well. It is the number of people living along coastal areas, rather than global warming, that is the most worrisome trend taking place. And to debunk the last claim in his quote, describing “hundreds of millions of climate refugees caused by the climate crisis,” realize that one of the nine documented “alarmist and exaggerated” claims referred to an Al Gore claim that “low lying Pacific atolls have already been evacuated.” It’s simply false. The man doesn’t need facts when hysterical claims suit his agenda better. The discovery of a tropical heat vent that computer climate models do not take into account could reduce the threat of global warming to meaninglessness. The journal Science published a seventeen year study of Greenland’s ice sheet that flatly contradicts the hysterical reports and bogus claims from nutjobs like Al Bore. And World Climate Report has an article titled “Antarctic Ice: A Global Warming Snow Job?” that similarly shows the bogus hyper-alarmism surrounding that region. Another study just released shows that Greenland’s ice – in contradiction to alarmist theories – has easily survived previous global warmings and very likely will survive many more. I’ve written previous articles detailing some of the vast research that has proven that “global warming” is NOT caused by man, but rather is a cyclical natural phenomena occurring roughly every 1,500 years. And I’ve written about the problem of ideology taking the place of genuine science, and the fact that scientists are literally being persecuted for debunking outright academic fraud and self-serving scientific errors. “Global warming” is very likely not a serious problem for mankind (believe me, it’s a LOT better than an ice age! ), but the real and growing threat of “global stupidity” looms larger than ever. And there seems to be no answer to this crisis.